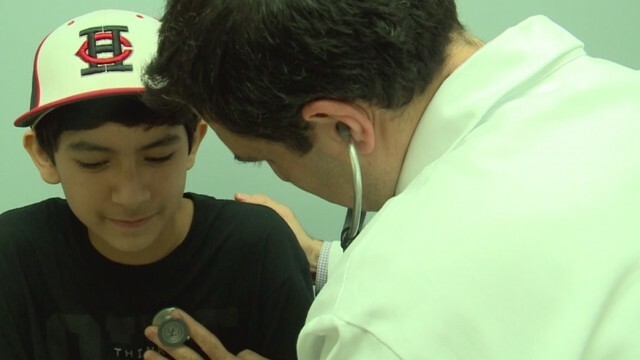 AUSTIN (KXAN) — There is a new collaboration between Dell Children’s hospital and UT Health Austin — the clinical practice of The Dell Medical School and the University of Texas. It brings together top heart surgeons and experts in their field to offer services to pediatric patients with complex, difficult to diagnose heart problems like 13-year-old Joaquin Solis. The Central Texas teenager has been playing baseball since he was five years old. "When I hit my first home run I was just happy," Joaquin said, but the heart he poured into the game almost took his life. Adam Solis says his son constantly struggled to catch his breath on the field but says doctors couldn't explain why and diagnosed him with asthma. "We were told there was nothing to be concerned about it and it was on life-threatening," he said. While at practice in September Joaquin suddenly collapsed on the baseball field, that's when his parents knew it was much more than asthma. "At that point I took off running towards him and he asked for his inhaler. Which I gave to him but his behavior was a lot different from the past, he just wanted to lay down and go to sleep there on the field," says Solis. Joaquin was rushed to Dell Children's Hospital. "He was at pretty high risk of dying. It was fortunate that he was able to be brought to Dell Children's" said congenital heart surgeon, Dr. Carlos Merry. Merry performed emergency open heart surgery on Joaquin and diagnosed him with a hidden heart problem called anomalous coronary artery. It's a condition often misdiagnosed and can be deadly. Dell Children's hospital tells KXAN, national research shows one in every 250 high school student-athletes has the condition. "These are maybe young athletes who are running on the field when they suddenly collapse," said Dr. Merry. It's one reason the Texas Center for Pediatric and Congenital Heart Disease program was formed, a new partnership to provide medical treatment for kids like Joaquin with rare heart problems before it's too late. "I think it will save their lives and the parents won't have to go through losing their child or someone," says Joaquin. The 13-year-old is looking forward to getting back on the baseball field with a whole new love for the game in his healthy heart. "I hope that other kids get to find out whats wrong with them if they have the same issues," he said.